Any game in the knockout stage that was undecided by the end of the regular 90 minutes, was followed by up to 30 minutes of extra time (two 15-minute halves). In extra time, the golden goal rule was applied, whereby the match would immediately end upon either team scoring, with the team having scored being declared the winner. If scores were still level after 30 minutes of extra time, there would be a penalty shoot-out to determine who progressed to the next round. As with every tournament since UEFA Euro 1984, there was no third place play-off. The top two placed teams from each of the four groups qualified for the knockout stage. In the first quarter-final, Portugal defeated Turkey thanks to a brace from striker Nuno Gomes. Italy beat Romania by the same scoreline, with Francesco Totti and Filippo Inzaghi scoring a goal apiece. The Netherlands thrashed FR Yugoslavia 6–1 in the third match, Patrick Kluivert (3) and Marc Overmars (2) amongst the scorers. In the final game, Spain's European dream came to an end with a 2–1 loss to France: Gaizka Mendieta's penalty goal was sandwiched by goals from Zinedine Zidane and Youri Djorkaeff. Raúl failed to convert a last-minute penalty kick that would hace sent the match to extra time. France and Italy both emerged victorious from their semi-finals against difficult opposition to reach the final. France beat Portugal 2–1 after extra-time; Nuno Gomes gave Portugal the lead in the 19th minute, which they held until just after half-time, when Thierry Henry equalised. The game went to extra-time and looked to be heading for a penalty shootout until Zidane struck the golden goal in the 117th minute. Italy drew 0–0 in normal time with the Netherlands and it remained the same through extra-time. The game went to penalties and Italy won the penalty shoot-out 3–1. The Netherlands had a particularly dismal showing from the penalty spot this game, with Frank de Boer having a penalty saved and Kluivert hitting the post during normal time, in addition to the failure of the Dutch to convert three out of their four penalties taken during the shoot-out. Perhaps most infamous was Jaap Stam's attempt during the shoot-out (which ballooned well over the crossbar), described by the BBC as "one of the worst spot kicks ever". ^ "Sending-off the turning point". UEFA.com. Union of European Football Associations. 24 June 2000. Archived from the original on 11 July 2000. Retrieved 1 July 2013. ^ "Well organised and disciplined". UEFA.com. Union of European Football Associations. 24 June 2000. Archived from the original on 29 August 2000. Retrieved 1 July 2013. ^ "Dutch superior in every way". UEFA.com. Union of European Football Associations. 25 June 2000. Archived from the original on 3 October 2000. Retrieved 1 July 2013. ^ "Both teams should be congratulated". UEFA.com. Union of European Football Associations. 25 June 2000. Archived from the original on 29 August 2000. Retrieved 1 July 2013. ^ "Dutch fire blanks in shoot-out". BBC Sport. British Broadcasting Corporation. 30 June 2000. Retrieved 14 June 2010. ^ "A brilliantly exciting game". UEFA.com. Union of European Football Associations. 28 June 2000. Archived from the original on 17 August 2000. Retrieved 1 July 2013. ^ "EURO 2000 team of the tournament". UEFA.com. Union of European Football Associations. 2 May 2016. Retrieved 14 April 2017. 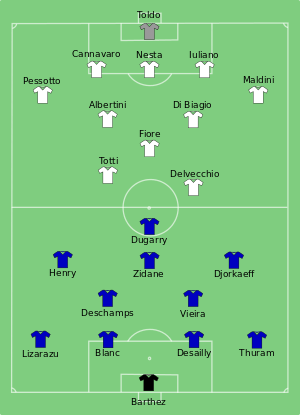 ^ "UEFA EURO 2000 - History - France-Italy". UEFA.com. Union of European Football Associations. Archived from the original on 4 November 2006. Retrieved 26 December 2017.